50 years ago, there was a near universal belief that snacking was bad for us. Your grandmother would say “It makes you fat”, or “You’ll ruin your dinner”. Back then, obesity was not such a big problem, so maybe they knew something. But then we changed our minds. To review the previous post click here. We’ve now decided that snacking is actually good for us. That eating more often will make us thinner, as ridiculous as that sounds. I’m sure you’ve heard the advice to eat more frequent, smaller meals to lose weight. That would mean that we should eat 3 meals a day and also multiple snacks in between. 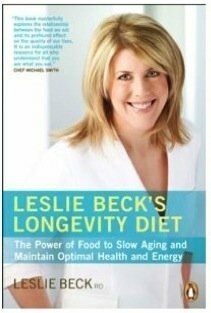 Dieticians such as the well-respected Leslie Beck, who writes in Canada’s national Globe and Mail newspaper feel that snacking is healthy for us. In her August 28th, 2012 article she writes “Snacks are an important part of every child’s back to school menu”. See? Not only should adults be eating all the time, kids should be, too. Too bad about that childhood obesity epidemic we’re having, though…..
How did we come to make such a 180 degree turn on snacking? The answer is explored in depth by Jacques Peretti’s absolutely fascinating BBC series “The Men who made us Fat“. The answer, I suppose not surprisingly is that it was the big food companies (Big Food) that convinced us that snacking was good for us. Sometime starting in the 1950′s the big food companies had a problem. They needed to sell more food to be more profitable. But with only 3 meals in a day, there was a limit on the amount of food sold. The deviously brilliant solution was to introduce new “eating opportunities”. If Big Food could convince us to add a snack between lunch and dinner then the opportunity to sell more food unfurls. A whole new category of food items to sell was created. It needed to be cheap and easy to eat. A perfect job for the refined carbohydrate. After all, cookies and crackers are mostly sugar and flour – and these do not spoil. Over the years, Big Food was able to convince us that snacking was not only acceptable, but it was also healthy. Seriously. The problem, as we explored in our last several posts, is that increased snacking increases the risk of insulin resistance. Insulin resistance requires 2 things – high levels and persistent levels. High levels of insulin are provided by the refined carbohydrates found in snacks. Persistent levels are provided by the increased eating opportunities. Insulin resistance is the ultimate outcome of all this snacking. Insulin resistance leads to higher insulin levels which leads to more insulin resistance. The higher insulin level then drives weight gain and obesity. Instead of a balance between the insulin dominant (fed) state and the insulin deficient (fasting) state, we now predominantly spend our time in the ‘fed’ state. And you wonder why we gain weight? Are we snacking more? 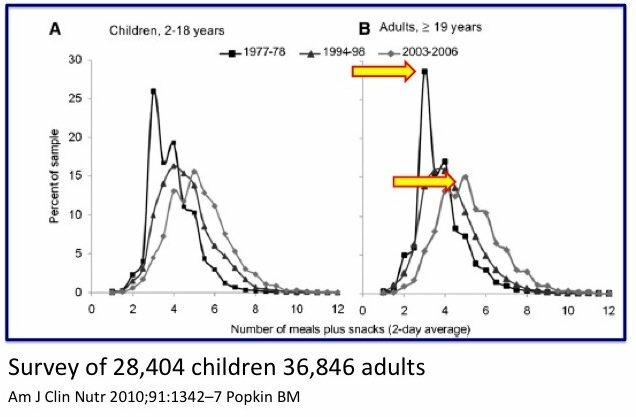 The paper “Does hunger and satiety drive eating anymore?” published in Am J Clin Nutr 2010;91:1342–7 by Popkin BM looks at the United States from 1977-2006. They used a survey of 28,404 children and 36,846 adult and tabulated the number of eating opportunities. Both children and adults show the same pattern over time. In 1977, most people ate 3 times a day – breakfast, lunch and dinner. No snacks. Obesity, not such a big problem. By 2003, most people were eating 5 times a day. That is, 3 meals a day plus 2 snacks in between. We are eating more frequently. Is it any great mystery why we are gaining weight? Taking the 50th percentile (the ‘average’) we’ve gone from eating 3.5 times a day to 5 times a day. The time between meals has dropped from 271 minutes in 1977 to 208 minutes. That is close to a 30% decrease in time between eating. We are eating all the time! Crazier still – we somehow think that this is good for us! Under the influence of doctors and dieticians and other medical professionals, we have been institutionalizing the practise of snacking. We begin by introducing it in our schools. We teach it to our children that it is acceptable to eat all the time. Not only acceptable, but healthy. We eat breakfast, a mid morning snack (for the long gap between breakfast and lunch), lunch, after school snack, dinner, and then in the time between soccer halves – another snack! That’s 5-6 times a day. It is now acceptable that we eat in the car. We can eat in the movie theatre. We can eat in front of the TV. We can eat in front of the computer. We can eat while walking. We can eat while talking. We can eat in a box. We can eat with a fox. We can eat in a house. We can eat with a mouse. I could go on, but then I’d have to pay royalties to Dr. Seuss. 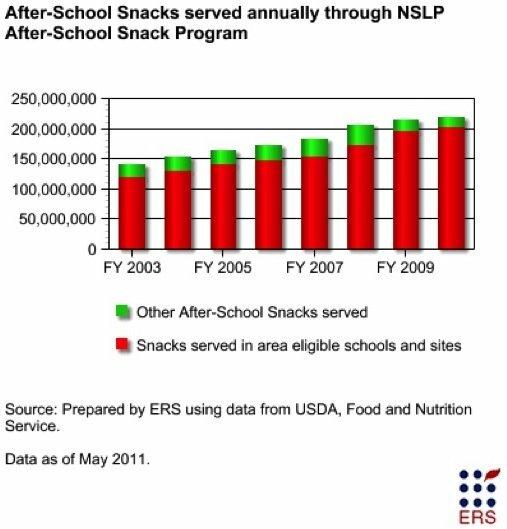 We spend millions of dollars to give our children snacks all day. Then we spend millions more to combat childhood obesity. Then we spend millions more to fight diabesity as adults. We give kids snacks all day. Then we berate the same kids for getting fat. We destroy their self-esteem. Then we give everybody a medal for participation to bolster their self-esteem. Arrgggg….. The reason is that our unhealthy preoccupation with calories leads us to the erroneous conclusion that only the first question matters. In the Caloric Reduction as Primary (CRaP) view of obesity, the meal timing doesn’t matter at all. But it does. Eating all the time leads to persistent of insulin levels which is a key ingredient in insulin resistance. Insulin resistance requires 2 things. It turns out that weight gain depends on both equally. It turns out that it is no more complicated than this – “If you eat all the time, you will gain weight”. The dietary changes wee have made since the 1970s have thoroughly prepared us for insulin resistance. This, of course leads exactly to diabesity. The answers, then are really very simple. Eat 3 meals a day. No snacking. Eat at a table for breakfast, lunch and dinner. Do not eat anywhere else. There are only 2 things to be fixed here. What to Eat. When to Eat. An old post to reply to but from what I have learned you can drink coffee, water, tea or bone broth on fasting days. No food otherwise it is not a fast. It’s okay to exercise on fasting days since we have more than enough body fat to sustain us.